Spending time with your dog by participating in an activity you both enjoy forges an extremely strong bond between man and his best friend. There is a whole range of dog sports that enable virtually every breed to participate. Some sports zone in on a dog’s natural ability (i.e. retrieving) while other sports are all about the creativity (musical freestyle). 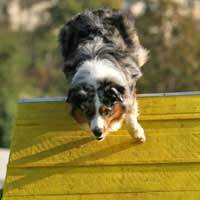 Agility requires a lot of training as the handler directs his or her dog over, under and through obstacles using only his voice, movement and body/hand signals. At no time can a handler physically direct the dog through the course. Agility courses are comprised of contact obstacles (A-frame, dog walk, teeter-totter/seesaw and crossover); tunnels (rigid, collapsed and interconnected); and jumps (hurdle, double and triple jump, panel jump, broad/long jump, tire). Agility courses also include weave poles and pause boxes/tables. Dogs win with points, which are based on the number of faults, including knocking down jump bars, as well as the number of seconds over the standard course time it took the dog to complete the course. The standard course time is based on the level of competition and course complexity. Pulling sports include carting where a dog, traditionally a large breed, pulls a cart filled with farm equipment or people.Sulky driving is where a dog pulls a two-wheeled cart with a person riding in it. Dry land mushing is when a dog pulls a dry-land rig, which has three or four wheels and is attached to the dog in the same way as a dog sled. The driver is either seated or standing. Flyball, Disc Dog and Musical Freestyle are some of the more crowd-pleasing ways to compete with your dog.Flyball – teams of four dogs, in a relay, “race against each other from a start/finish line, over a line of hurdles, to a box that releases a tennis ball to be caught when the dog presses the spring-loaded pad, then back to their handlers while carrying the ball,” according to Wikipedia. Disc Dog – the handler throws a Frisbee and the dog has to catch it. Competitive events also include short routines, set to music, which utilize multiple discs and choreography. The dog and handler are judged on athleticism, difficulty and showmanship. There are also short-distance events in which teams have 60 seconds to catch as many discs as they can while increasing the distance between themselves. Musical Freestyle, Freestyle Dance and Canine Freestyle are all a mix of obedience, tricks and dance.Another version is Freestyle Heeling, which concentrates on the dog staying in various heel positions while the handler moves around the dog to music. Field and Tracking trials both rely on a dog’s natural searching and retrieving abilities.In field trials, hunting dogs must retrieve fallen prey – usually a real bird, through a vast distance and complex path.Tracking emulates the finding of a lost person or object. “A dog must work continually as if genuinely looking for a lost person without assistance from the handler and find the required number of lost articles and the tracklayer at the end of the track,” according to Wikipedia. Competitive obedience training goes miles beyond your basic sit, down, stay and come commands we all try to teach our dogs in puppy school. “The dog and handler must perform the activities off-leash and in a highly stylized and carefully defined manner,” according to Wikipedia. When deciding which sport to participate in with your dog, make sure both you and the dog find enjoyment in it. As well, each sport requires a significant amount of dedication and specialized training. So don’t think you and your dog will be immediately competition ready or worthy. And the best way to learn any new sport is through a school that specializes in dog sports.